Why are tropical cyclones named? 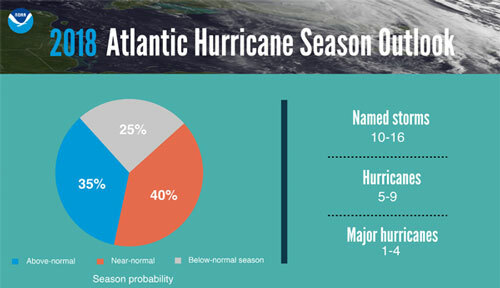 Tropical cyclones are named to provide ease of communication between forecasters and the general public regarding forecasts, watches, and warnings. Since the storms can often last a week or longer and that more than one can be occurring in the same basin at the same time, names can reduce the confusion about what storm is being described. According to Dunn and Miller (1960), the first use of a proper name for a tropical cyclone was by an Australian forecaster early in this century. He gave tropical cyclone names "after political figures whom he disliked. By properly naming a hurricane, the weatherman could publicly describe a politician (who perhaps was not too generous with weather-bureau appropriations) as 'causing great distress' or 'wandering aimlessly about the Pacific.'" (Perhaps this should be brought back into use ;-) During World War II, tropical cyclones were informally given women's names by US Army Air Corp and Navy meteorologists (after their girlfriends or wives) who were monitoring and forecasting tropical cyclones over the Pacific. From 1950 to 1952, tropical cyclones of the North Atlantic Ocean were identified by the phonetic alphabet (Able-Baker-Charlie-etc. ), but in 1953 the US Weather Bureau switched to women's names. In 1979, the World Meteorological Organisation (WMO) and the US National Weather Service (NWS) switched to a list of names that also included men's names. The Northeast Pacific basin tropical cyclones were named using women's names starting in 1959 for storms near Hawaii and in 1960 for the remainder of the Northeast Pacific basin. In 1978, both men's and women's names were utilized. The Northwest Pacific basin tropical cyclones were given women's names officially starting in 1945 and men's names were also included beginning in 1979. Beginning on 1 January 2000, tropical cyclones in the Northwest Pacific basin are being named from a new and very different list of names. The new names are Asian names and were contributed by all the nations and territories that are members of the WMO's Typhoon Committee. 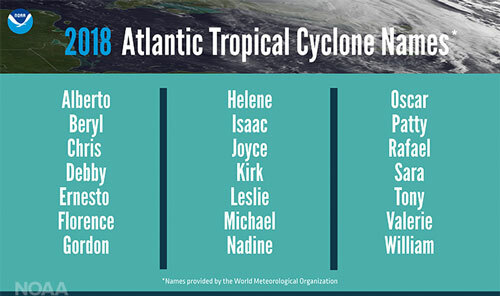 These newly selected names have two major differences from the rest of the world's tropical cyclone name rosters. One, the names by and large are not personal names. There are a few men's and women's names, but the majority are names of flowers, animals, birds, trees, or even foods, etc, while some are descriptive adjectives. Secondly, the names will not be allotted in alphabetical order, but are arranged by contributing nation with the countries being alphabetized. The North Indian Ocean region tropical cyclones are not named. The Southwest Indian Ocean tropical cyclones were first named during the 1960/1961 season. The Australian and South Pacific region (east of 90E, south of the equator) started giving women's names to the storms in 1964 and both men's and women's names in 1974/1975.